Black Dove, White Raven was easily my most anticipated book of 2015. I have loved everything I've read by Elizabeth Wein, and was excited to learn about the Italian-Ethiopian War, which I had never heard of. Most of my history knowledge comes from historical fiction, for better or for worse! Emilia and Teo are the children of female pilots in the 1930's, which means their different races are not the only things that make them stand out. When a freak accident causes the death of Teo's mom, the remaining mother moves the children to Ethiopia, the land of Teo's heritage, and a place where they will not be judged by their race. Unfortunately, the threat of war with Italy causes its own set of problems, which will have devastating consequences for them all. I've always enjoyed the way Wein writes friendship as a love story. The mothers, Rhoda and Delia, are depicted as soulmates, almost romantic in their devotion to each other. I wish there had been more chapters about their history and relationship, because it sounds fascinating (and similar to Wein's other novels). Emilia and Teo are raised as siblings and each other's only friends. They become everything to each other, and save each other's lives over and over again. I love my friends very much, but wonder if friendship was deeper in the past, before social media and even telephones. To be friends, you needed to be more present and close. As they grow, Emilia and Teo adopt the alter egos of Black Dove and White Raven. Their fantasy stories about these characters litter the book, and were my least favorite part of the novel. They usually held pretty strong metaphors for what was happening with the characters, but I couldn't get into them the way I liked reading about the real people. I'm sure others will have different opinions about this. 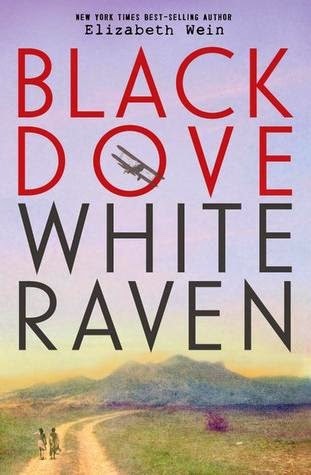 Black Dove, White Raven wasn't as strong as Code Name Verity or Rose Under Fire, in my opinion. Still, it is so far above average that I will enthusiastically recommend it. I loved learning about a new time period and found myself doing extra research for more information on what was happening. Wein's novels always push me to learn more. Thank you to NetGalley for providing the ARC.